The Relentless Pursuit of Market Manipulation: Are You Armed? A funny thing happened on the five year journey to compliance with emerging Dodd-Frank regulations. Regulators are relentlessly honing in on existing market manipulation regulations. Particularly, investigations and actions related to Wash Trading and Spoofing. Investigation costs, fines and penalties have impacted financial institutions, hedge funds, independent speculators and even utilities and commercial businesses. In fact, not only are the SEC, FERC, CFTC, exchanges and market operators on the hunt, the Department of Justice is also pursuing criminal and civil complaints. Organizations that transact in commodity and financial markets must have controls in places to defend against new market manipulation definition and precedent. What is a Wash Trade? 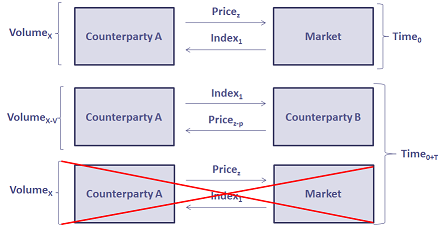 Wash Trading is simultaneously buying and selling the same commodity or financial instrument, (for brevity, ‘security’), usually at the same price for the same quantity. The trade, typically, results net zero incremental volumetric exposure for the transacting parties, and generally no net gain or loss. Wash Trading is deemed market manipulation because it can lure market participants into an illiquid market under false pretenses or scare others away from a market they may feel is gamed. From a company perspective, Wash Trading can falsely “mark” the value of security prices to inflate, (or deflate), collateral/margin requirements and mark-to-market profit and loss statements that often impact compensation. Spoofing occurs when a bid, (or offer), is placed in the market with no intention to transact and then is immediately cancelled once other market participants transact or place a bid, (or offer), at higher, (or lower), prices. Spoofing can falsely give the impression of demand to lure other Market Participants to transact at unfavorable prices, often with the ‘spoofer’. These trading strategies are alleged to threaten underlying market principles that a fair and orderly market is where best bid meets best offer. Wash Trading and Spoofing are a form of gamesmanship that regulators believe damage the integrity of the market. Yet, detecting intent to manipulate the market is opaque. For example, often transactions are reversed or cancelled because of changing risk exposure or an error. However, regulators are now demonstrating that it is the onus of the transacting party to prove innocence. To the regulators, it does not matter if this activity resulted in financial gain. Intent implies guilt because it can adversely affect other market participants. Intent should be documented at the time of the transaction or a potential violation needs to be detected early. What is Market Participant Response? A 2015 Committee of Chief Risk Officers (CCRO) survey on Commodity Risk Management Practices showed some market participants are not implementing robust controls to mitigate and monitor regulatory compliance. Regulatory compliance is status quo for many market participants. Common practice is to ensure rules are interpreted and communicated, ad-hoc review of transactions – followed by high-cost crisis management to respond to any regulatory data requests and inquiries. Market participants are distracted. Over the past five years regulators are still struggling to clearly define many Dodd-Frank rules. And lock-step, market participants are carefully trying to understand and standardize interpretation of these new regulations. Market participants are cost conscious. Market economics have reduced company budgets, and uncertain regulations create fear of regretful spending. In many cases organizations have only implemented highly manual, least-cost compliance processes and systems. In a time where the stakes of non-compliance is high, it is disconcerting that many market participants are forgoing robust and systematic regulatory compliance for conservative cost management. What are some market participants doing? Proactive organizations are improving regulatory training, refining compliance processes and implementing trade surveillance algorithms and case management programs. Regulatory Training – Structured regulatory compliance training enhances traditional regulatory review and synopsis communications. Interactive situational training programs that require pass/fail testing, in-house certification and regular refreshes are becoming an auditable standard. Compliance Processes – Regulation FAQ sheets and access to company regulatory compliance professionals are being enhanced with impact mapping of regulations. Interactive process maps that interpret rules and company guidelines help reinforce training and provide a tool for non-compliance professionals to understand, test and improve compliance processes. Trade Surveillance Algorithms – Complimentary to transaction and risk systems, trade data is staged for evaluation by a suite of comparative and probabilistic analytics that serve as an early detection and case management system. Trade surveillance algorithms identify transaction outliers that may be interpreted by regulators as violating market regulations. When outliers are identified, compliance managers can research and document events at the time of occurrence, and if necessary, escalate for appropriate disciplinary action. This modern framework demonstrates to the regulator proactive enforcement of compliance that can mitigate sanctions and fines. Legal and staff costs are also mitigated through data retention and early documentation. Since the banking crisis, emphasis on governing and managing risk exposure to market manipulation has shifted market participant behaviors. It is clear in recent Presidential debates that attention to market manipulation may change in form, but will not wane. A potential client recently scolded me, “Wash trading is old news. Everyone has it under control.” Evidence demonstrates the contrary. While many are ahead of the curve, many others are still ill equipped. Please share your insights and questions. And, if you like what you have read please “like” this blog, follow me and share with your colleagues and social media! Sid Jacobson works with organizations to improve their risk management and compliance capabilities. With over 25 years of experience driving change and growth for companies engaged in energy and derivatives markets, Sid is known for strategic visioning complemented with a successful track record implementing improved commodity strategies, commercial operations, risk management and regulatory compliance. Sid is the founder of Pivotal Risk Advisors. If you would like to learn more about our capabilities visit www.pivotalriskadvisors.com.